The Del Webb retirement community of Sun City Grand in Surprise Arizona is neatly divided by the loop-303 highway. The construction that took place west of the loop-303 happened to coincide with about the time that Pulte Homes bought out Del Webb and the rights to the Sun City name. There are some pockets of Pulte built homes in the Sun City Grand 85374 zip code as well but most of the Pulte built homes reside west of loop-303. This makes it a little easier to find MLS listings for those who feel strongly about having a Del Webb built home vs. a Pulte built home. 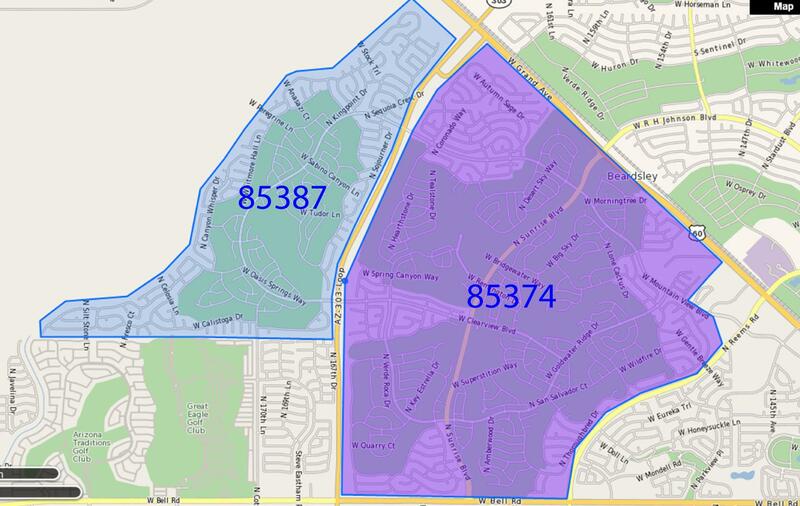 For those that want the newer construction in Sun City Grand your focus will be in the blue section... or the Sun City Grand 85387 zip code. To make sure you are getting exactly what you want though, the best course of action is to let me set you up with a custom search.